It is possible to import phone book entries from a mobile phone into XGnokii or export phone book entries from XGnokii into a mobile phone. 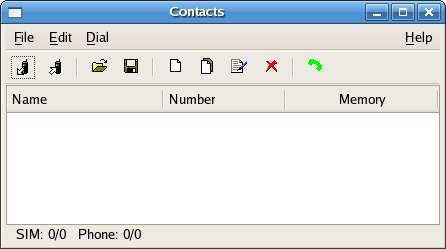 To import phone book entries on Linux, click CONTACTS (see  in figure 1) in XGnokii's main window. In the Contacts window that appears, select Read from phone on the File menu. Figure 6. 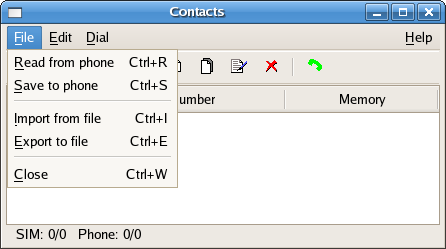 The screenshot of XGnokii's Contacts window in Linux (GNOME, Fedora Core 5). Figure 7. The screenshot of XGnokii's Contacts window in Linux (GNOME, Fedora Core 5) when the File menu is clicked. XGnokii allows you to add, duplicate, make changes to or delete phone book entries. 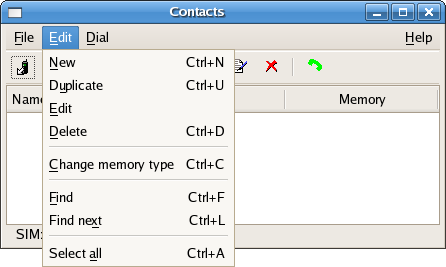 To do so, select New, Duplicate, Edit or Delete on the Edit menu in the Contacts window. Figure 8. The screenshot of XGnokii's Contacts window in Linux (GNOME, Fedora Core 5) when the Edit menu is clicked. To reflect the changes you made to the imported phone book on the mobile phone, select Save to phone on the File menu in the Contacts window (see figure 7).